When shall we say, less than right leaning Huffington Post and the editorial board of the San Francisco Chronicle, Dianne Feinstein’s own home newspaper are calling on her to debate she had better pay attention. Daily, as more voters listen to Elizabeth Emken’s vision for California and the United States the are beginning to see that its Feinstein’s fundamental lack of understanding of economics and her tired tax and spend policies that have led the U.S. and CA to the edge of the Economic abyss. Dianne Feinstein is attempting to avoid debates at all costs as her policies are not debatable. A sharper, younger Elizabeth Emken is ready to replace the 79 year-old senior senator from CA who is arrogant, and has lost complete touch with her constituents. Please see Elizabeth Emken’s qualifications here. Feinstein would gladly destroy the Second Amendment. Elizabeth Emken, growing up around weapons will vigorously defend our God-given right affirmed by the Supreme Court of The United States to bare arms. Feinstein is constantly mired in ethical situations regarding steering billions of dollars of taxpayer contracts to her husband Richard Blum’s companies. Feinstein votes to raise taxes, Elizabeth will not. 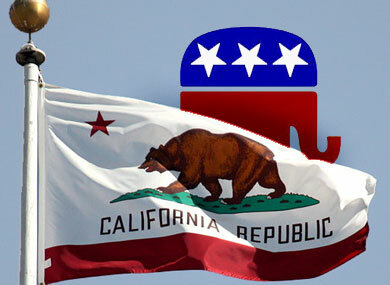 According to the Bureau of Labor Statistics, California ranks 49th among the unemployed largely the result of progressive policies believe in by Dianne Feinstein. Elizabeth Emken will go to work immediately to begin reversing this trend which drove companies and jobs from her state. Feinstein is joined at the hip with Obama and his woeful health care law, Elizabeth Emken has made removing it her number one priority. For political junkies like me, October in an election year is the equivalent of several Super Bowl Sundays-full of not only presidential and vice presidential debates, but debates from various races across the country thanks to C-SPAN. Debates are not only entertaining and informative, they’re a powerful reminder to politicians that they serve at the pleasure of we the people and an important part of keeping their egos in check. There’s something about the sight of an incumbent politician having to stand next to their challenger and field questions either from citizens or journalists that serves American democracy well. 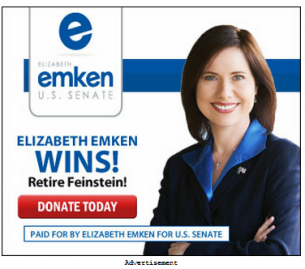 So imagine my surprise when I learned that not only is my senator, Dianne Feinstein, refusing to debate her opponent, a political novice named Elizabeth Emken, but she did the same thing to a previous opponent six years ago. But this time, there is a chorus of opposition to Feinstein’s attempted coronation from across the political spectrum including, most notably, the Los Angeles Times which urged the senator to debate her opponent. To make matters worse, Feinstein has now given two interviews, one to the San Francisco Chronicle’s editorial board in which she appears to barely conceal her anger at being asked the question and the second in which she literally walks out of the interview. Certainly political junkies like me have no right to have my love of debates satiated every two years, but voters do have a right to see those who would seek to represent them in Washington have a clean and honest debate about the issues with one another. Coronations are for tin horn dictatorships. The American way since the founding of our Republic has been to err on the side of more debate not less. Debate or no debate, Mrs. Feinstein will likely win her race, but she owes her opponent and more importantly we the voters, an honest debate.